In Norway, with a population of 4 million people and 2 million bicycles, 60.000 bicycles disappear each year, never to be seen by their owners again. These owners shed tears, rail against the sky, and then go out and buy a crummy bike to get around on. The victims of bicycle theft tend to be people who use their bicycles: students, commuters, hobbyists, hard-core riders, and children. Most bicycle crime occurs in cities where there are colleges and universities. Most bicycles are stolen from places owners assume are safe. 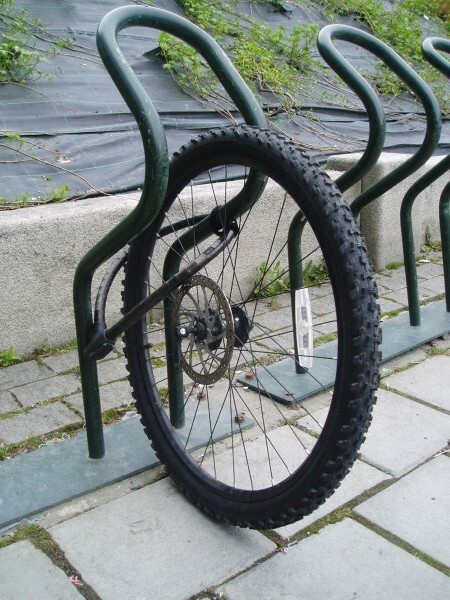 Experienced thieves can take even locked bikes in about 10-20 seconds. Bolt cutters will cut most chains and cables, and U-style locks are broken by inserting scissors-style car jack inside the U and cranking. Within the drug trade, stolen bicycles are so common they can almost be used as currency. On the streets, the value of a stolen bicycle is approximately 5-10% of the bicycle’s original retail value, with an inverse relationship between value and percentage worth on the street. According to numerous interviews with industry insiders, the percentage goes up as the value goes down; a bicycle that sells for NOK 4000 new will sell for NOK 400 on the street when stolen, and a new NOK 50.000 chromealloy machine will sell for as low as NOK 2.500. About 10% of the stolen bicycles are exported for Norway to Russia and Eastern Europe. A casual observer might consider all this theft good for the bicycle industry. If a bicycle is stolen, then that bike’s owner has to go out and buy a new bike. But the effect of bicycle theft is to poison the market. Overall spending is lowered due to the risk factor. Customers concerned about theft tend to buy lower quality bikes or not to buy bicycles at all. If there were fewer stolen bikes in the marketplace, the people who now buy stolen goods would instead buy legitimate used ones for not that much money more, thereby further bolstering the value of good new bikes, which would have a higher resale value. The industry would restabilize at a higher dollar volume of business. The bottom line is: people would spend more on bikes and use them more frequently if they weren’t constantly worried they were going to get ripped off. In 1993 about 100.000 bicycles were stolen. About 25.000 thefts were reportet to the police, and 18.000 thefts were reported the insurance industry who payd annual NOK 70 million. Even though 10.000 bicycles were found and delivered to the police property rooms, less than 2.000 bicycles were identified and returned to their owners. The insurance industry wanted to reduce their losses and startet a national bicycle registry to identify stolen bicycles. The bicycle registry is owned by the Norwegian Financial Services Association (FNH), but driven by the Norwegian Falck company. In 2005 over 500.000 bicyles are registered. The annual number of stolen bikes in Norway has been reduced from 100.000 in 1995 to 60.000 in 2004. The bicycle thefts reported to the police have been reduces from 26.577 to 19.141. The thefts reported to the insurance industry have been reduced from 18.100 til 9.468, and their losses have been reduced from NOK 70,8 to NOK 34,0 million.